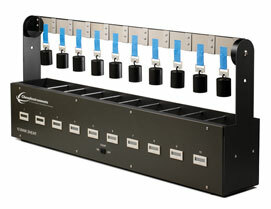 Precise room temperature shear tests are made easier with the ChemInstruments Room Temperature 10 Bank Shear Tester. It performs shear tests according to PSTC-7 Procedure A, TLMI Test No. 7, and ASTM D 3654, Procedure A for holding power of pressure sensitive tapes. It can also be used for PSTC-14, adhesion of pressure sensitive tape to fiberboard at 90° angle and constant stress, and PSTC-7 Procedure B. 美国ChemInstruments 公司研制的 RT-10室温持粘性能测试仪,设计符合于欧美及其它国家对压敏胶性能的测试标准, 例如PSTC-7 A, PSTC-7 B及PSTC-14 (压敏胶对纤维板的测试标准), TLMI No. 7, 以及ASTM D 3654 A.